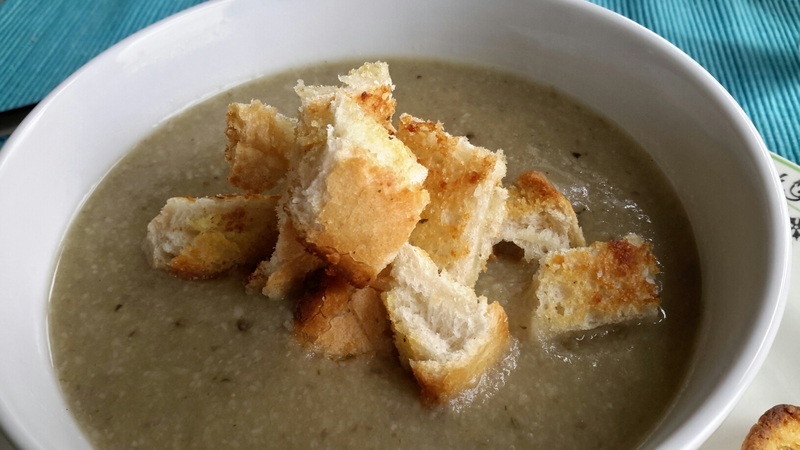 I don’t like to blog too much about food I made and didn’t enjoy so this will be a quick post… A recent free magazine from Sainsbury’s had a nice looking and easy recipe for mushroom soup. I do love mushroom soup so gave it a go. But having now made, I don’t think the soup had enough flavour. I know I’ve made better mushroom soups in the past (like the red wine and mushroom soup from Jack Monroe’s website) so this recipe will be going into the recycling. Served with croutons, that I made from a chopped up garlic bread slice from Morrison’s… Thankfully I only have one portion of this to eat now til all gone. It is disappointing when a recipe doesn’t turn out the way you hoped. This entry was posted in Soup, Vegan, Vegetarian and tagged mushrooms, potato, sainsburys, soup, thyme. Bookmark the permalink.